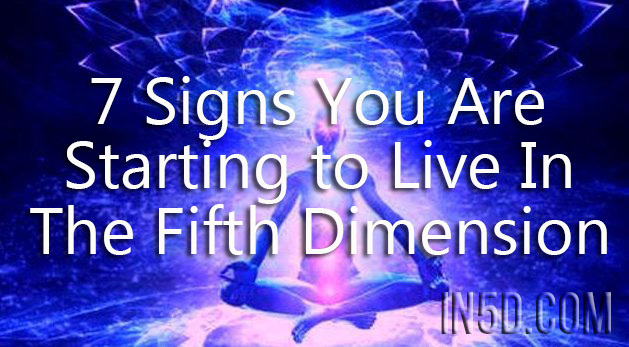 7 Signs You Are Starting to Live In The Fifth Dimension – Don’t Ignore Them! Yes, in this article we’re going to answer this question for you – what does it mean to shift from 3D consciousness into the 5th dimension? Some people say this shift is like a massive update to your entire operating system. Yes, and it feels like upgrading from human consciousness 3.0 to galactic consciousness 12.0. Well, this means that when we are ready to move beyond the 3rd dimension, we must go through the 4th dimension before we can enter the 5th. The 4th acts much like a purifying filter, for it is the realm of the heart that is filled with love, oneness and lightness. The 5th dimension is an even lighter in frequency, having a more pure love, cosmic consciousness and a true multi-dimensional reality. And, remember – we will be inside this photon belt of energy for the next 2000 years, causing a massive shift in consciousness for the entire humanity. Yes, ladies and gentlemen, everyone on our planet will be shifting from 3D consciousness into a 5th Dimensional “enlightened reality”. The shift will be bringing humanity into the Aquarian age of being one unified harmonious world working together in peace. It will occur as a very slow digestible rate that is easy to assimilate and integrate. There are 7 basic signs that will show you’re entering the 5th dimension. The cool aspect is that these signs happen for everyone. There are many more wild multi-dimensional experiences that will naturally occur for you during your shift from 3D to 5D, yet these 7 signs are guaranteed across the board. If you are willing to remain in trust, love and surrender to your highest self you will naturally ascend and open yourself up to experiencing the 5th Dimensional consciousness with joy and effortless ease. And, one more thing – don’t take the shift too seriously! Just have fun and remember this is all a massive play of consciousness here for our individual and collective awakenings. The 4th and 5th dimensions will provide an upgrade in your operating software and DNA hardware. It’s just like your mind-body will be offered to work inside the newest fastest computer that operates smoothly at the speed of light! This process will help if you reboot it (meditate, exercise and go raw/vegetarian diet) which will make your body and mind much more stable, expansive, have a sharp creative mind, clear memory, and make your overall life much easier to operate. Yes, and you’ll be open to trusting the constant effortless flow of life in each moment. A real feeling of wonder and excitement will be inside you about your life, as this natural lightness will help you to greet new opportunities with real love and gratitude each moment. Everyone is here to do their work of learning the lessons their soul came here to learn. And, you must learn how to let go, drop your negativity, smallness, powerlessness, incompetency, and poverty consciousness. You will be releasing all your old heavy baggage you’ve been carrying for lifetimes! This is the only way you can enter into these higher vibrational 4D and 5D levels that are full of trust, lightness, laughter and love. Instead of it taking months or years in psychotherapy for your karma to dissolve it will take minutes or seconds! It’s like the Universe will be turning up the velocity on your inner juicer and turning your dense heavy substances (thought feelings) removing the pulp, keeping the essential nutrients and giving you a more enlightened experience of life that feels like liquid light! You’ll notice that the colors of the world will look brighter, stronger! Yes, and you’ll see a wider spectrum of colors, that may appear like rainbow ‘hippie’ colors. When you’re more emotional the colors are even more beautiful and have a happy vibration to them. When you meet people who are living in the 5th as well, can bring up such a deep happiness inside they could bring tears of joy to your eyes. You will be able to hear the divine song of creation, the music of the spheres, the eternal OM, and the sound of silence. You can attune your listening to an orchestra of light that is constantly playing in the background, bringing tears of joy to your heart. Time will feel fluid and you’ll move like water from one event and life experience to the next. There will be no judgment or ill feelings about how or why things are done the way they are done. You will realize that you are not the doer, and that things are being done through you. The 3D view of time will seem pointless and like kindergarten consciousness as you’ll understand that there is no end to this life. You’ll know you are an eternal being who cannot die and is all powerful. You’ll realize that when your life in this body is over, you will continue to live on and on forever. You will know this without any doubt. 5. You’ll constantly have unexplainable synchronistic experiences and “miraculous” manifestations will happen regularly. You’ll experience amazing synchronicities – almost every day. The Universe will be speaking to you constantly, giving you “signs” on where to go and what to do. It will feel like you are on a miraculous journey through a magical world and anything is possible! When your third eye is fully open, you will start to see through this 3D dimension and into the 4th and 5th. This means you may start seeing lights, portals or layers of energy in the sky or perhaps right across your kitchen table. As the veil between dimensions gets thinner you will see more and more of what is really around you. Science and spirituality will truly become one and you will have full and total understanding of how it all works as you will be merged with the oneness of all things. By practicing listening to your guides on the higher realms, you’ll be able to know anything about anyone at anytime. Your mind will begin to quiet, which means that you’ll be able to hear your guidance from the other dimensions. This may be from angelic guides, spirit guides, past ancestors, or beings on a higher plane showing you the way home. As you tune into this, you will soon realize that you have many beings in higher dimensions that are around you helping you all the time. Whoever you connect with you will feel extremely supported, safe, secure as the frequency on the planet will be soooooo high that no lower dark energies will be able to survive here. You will be able to trust 100% in the connect and experiences you have. Because time and space are illusions, and all matter is energy and consciousness, and you are made of the same stuff as everything around you, you’ll be able1 to manifest the most amazing things with your mind. You will be able to learn how to pass your hand through a solid surface, physically levitate above the ground, move objects with your mind, bi-locate, be in 3 or more places at the same time, and basically anything that you can imagine you will be able to experience. Advanced beings will assist you and even help you to time travel with your body to other worlds and dimensions. You will enter into the sphere of your existence which means that you’ll be able to jump into any event in your life, past or future instantly and experience whatever it is you wish to experience.